Altogether, well over a hundred diseases are capable of being transmitted from animals to humans, although most are rare in North America. All domestic animals including dogs, cats, birds, horses, cows, sheep, goats and rabbits can potentially spread diseases to people, but rarely does this actually occur. If pet owners exercise basic hygiene principles, especially hand washing, most of these potential diseases can be avoided. 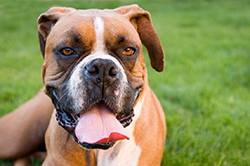 How great is the risk of contracting a zoonotic dis­ease from my dog? "If you fall into one of these categories, it doesn't mean you have to give up your pet!" If you fall into one of these categories, it doesn't mean you have to give up your pet! It simply means that you should take some basic precautions such monitoring your dog for any signs of illness, washing your hands after extensive handling of your dog, and avoiding direct contact with your dog's feces or urine. "... the benefits of having a pet far outweigh the risks." It is important to keep in mind that numerous studies prove that the benefits of having a pet far outweigh the risks. Sharking your home with a pet is often just what the doctor ordered! While the risk of contracting any of these illnesses is low, here is a list of common zoonotic diseases. Note that many of these infections are the result of eating undercooked meat, fish and poultry, or involve exotic animals and travel. Which of these are more likely to cause serious illness to humans? Rabies, caused by a virus, is almost invariably fatal in man. 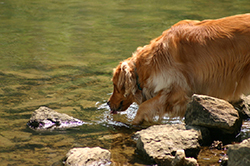 Leptospirosis, known as Weil's disease in man, can cause extremely serious liver and kidney disease but the transmission from dogs to humans is very rare. Humans usually contract this disease from exposure to contaminated water. Roundworms (Toxocara canis) and tapeworms (Echinococcus species) can cause liver problems, but illness in man from these causes is rare. Direct handling of infected dog feces can potentially cause an infection of Toxocara canis in a susceptible person. Echinococcus tapeworms are very rare in dogs, and humans cannot directly become infected from a dog (tapeworm infections require an intermediate host for transmission). Zoonotic skin diseases including ringworm, caused by the fungus Microsporum canis and scabies, caused by the mite Sarcoptes scabiei, Cheyletiella, and Harvest Mites (Trombicula species) are transmitted relatively easily to people through direct physical contact. "Simple hygiene and common sense will drastically reduce if not eliminate the risk of zoonotic spread of disease from dog to man." Make sure that any sign of illness or disease in your dog is diagnosed and treated promptly by your veterinarian. If your dog is sick, make sure you wash your hands after any contact. Bathe and groom your dog regularly. This will increase the chance of early detection of any skin lesions. Give your dog a broad-spectrum deworming product on a regular basis. The simplest way to do this is to use a monthly heartworm product that includes a dewormer. Wear gloves when gardening or working in areas where dogs, cats or other animals may have urinated or defecated. 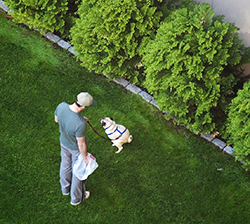 Pick up any feces on your property and "stoop and scoop" when you take your dog for a walk. Dispose of all waste materials promptly and safely. Provide separate food and water dishes for your dog, and wash and store them separately from your family's dishes and bowls. Transmission of disease can also be from human to dog. Sore throats, tuberculosis and fleas are common examples. Additionally, enteritis due to Campylobacter and Salmonella infections can be passed from an infected family member to the family dog.